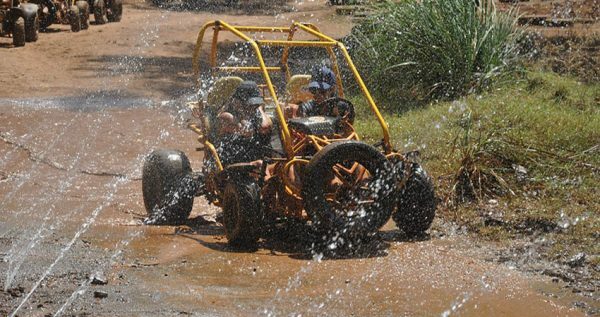 Icmeler Buggy Safari is a very exciting tour reserved especially for the outdoorsy types among you, as well as those who are looking for some adrenaline boost. 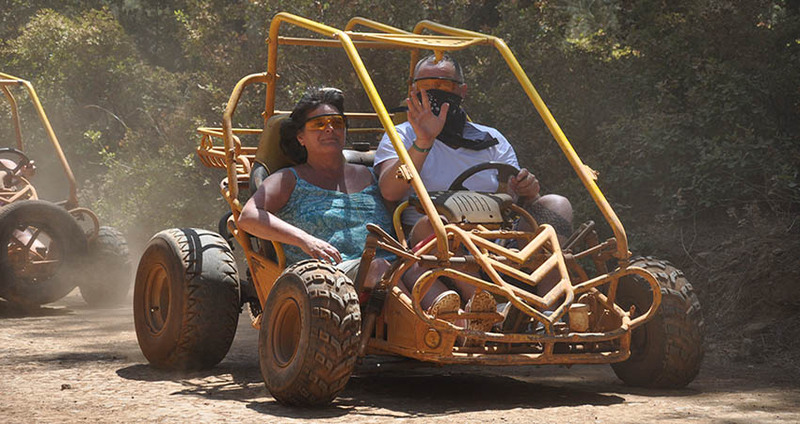 Buggies are opened vehicles so you will get to feast your eyes on the gorgeous lush greenery while driving through the forests which surround Icmeler. This tour starts with a free pick-up from your hotel in Icmeler, followed by a comfy drive to starting spot which is about twenty minutes away from the town itself. Starting point of Icmeler Buggy Safari Tour is around 15 kilometers away from the city, on the north side of Icmeler. 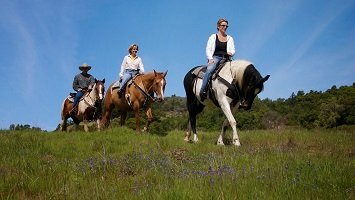 At the very beginning of the tour there will be a meeting organized so that all the participants get informed about propositions and rules of this terrific tour. At that meeting the instructions are given to everybody in order to be informed about safety rules and regulations too. Demo ride is organized so that participants to be can get to know better what the tour is about and how everything functions. Everything is set for tourists in order to get familiar with vehicles. This might sound unnecessary to you now, but your safety is our outmost concern, and that is why we take care of all the details prior to the beginning of the tour. 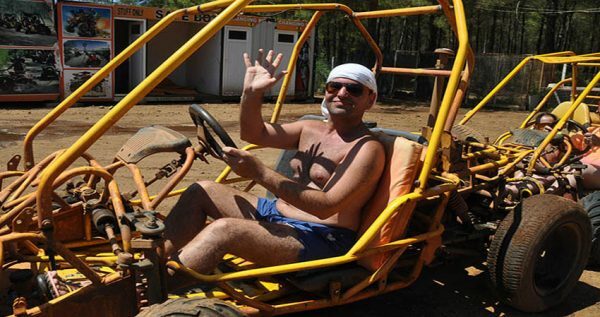 This awesome tour takes place in the gorgeous and captivating emerald forests around Icmeler. 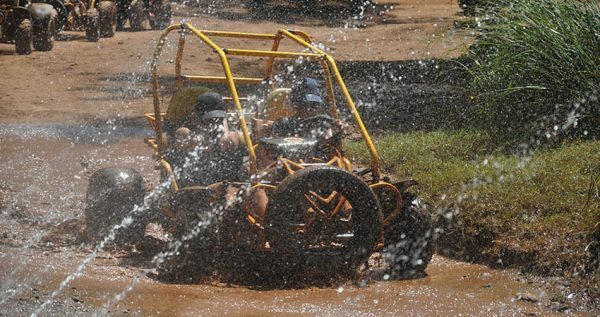 You don’t have to have any driving license or special permit to drive a buggy. Our skillful will be with you all the way if you need them. There will also be a photographer traveling with you, taking photos and videos of you and your friends having fun during the tour. Once the tour ends, you can buy your pictures as souvenirs and bring them back home to show your friends and family what a great time you had in Icmeler. 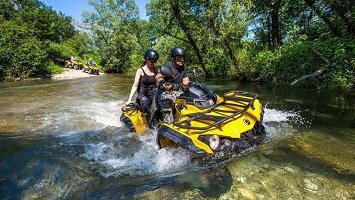 This experience will satisfy all your senses and bring you back to childhood when you used to spend more time in nature exploring and having fun. Fresh air and birds chirping, will help you relax and unwind as your fun buggy bumps through the woods. 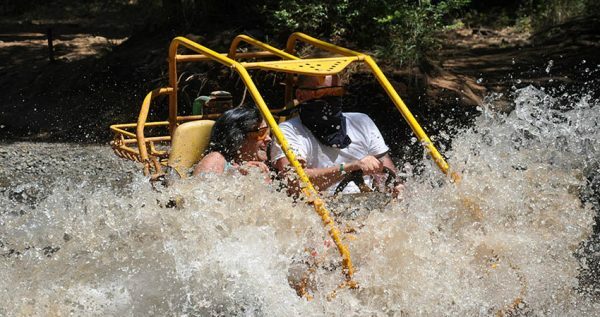 Don’t hesitate, reserve your spot on this terrific Icmeler Buggy Safari Tour now! Sun Creams, Comfortable Shoes or Sneakers, Sun Glasses, Spare Clothes, Camera. 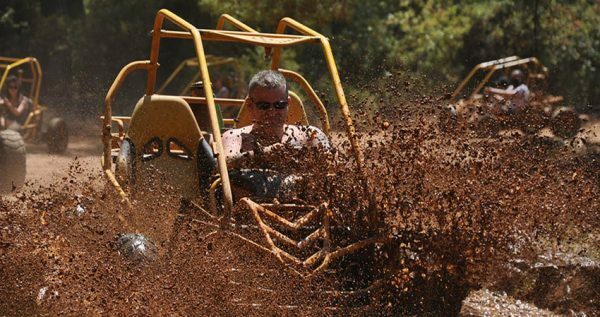 We recommend you to bring extra clothes to this excursion as you will get dirty. You can use the showers at our facility afterwards for cleaning. 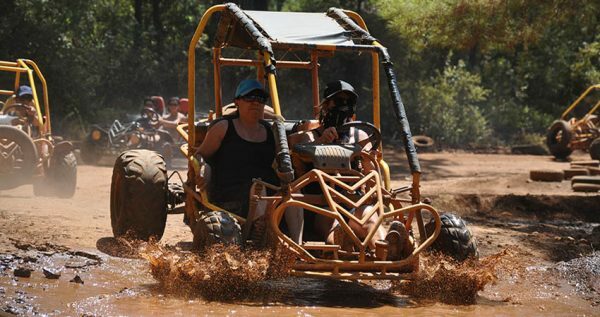 Icmeler Buggy Safari starts with a complementary pick up from your accommodation, followed by a short and cozy drive to the action venue located on the outskirts of the city. This thrilling tour lasts for approximately 4 hours from pick up to drop back service. 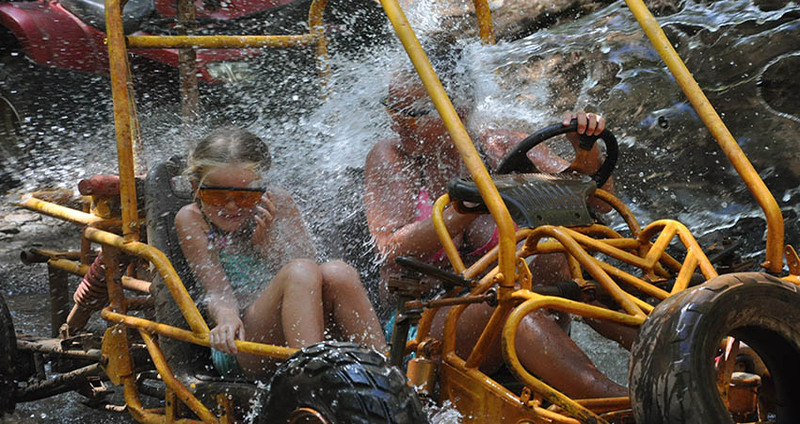 As Excursion Mania we have 2 sessions of Buggy Safari offered per day, so you can pick your preferred time. The first session of Buggy Safari starts at 10:00. Once we arrive to the venue, our instructors will greet you and hold a briefing. You will be able to get more familiar with your vehicles and you will learn some details about the upcoming tour. This briefing is essential in order for you to have the best experience possible. It will be followed by a demo ride, which will also help you get more comfortable with your vehicle and get a better sense of your surroundings. 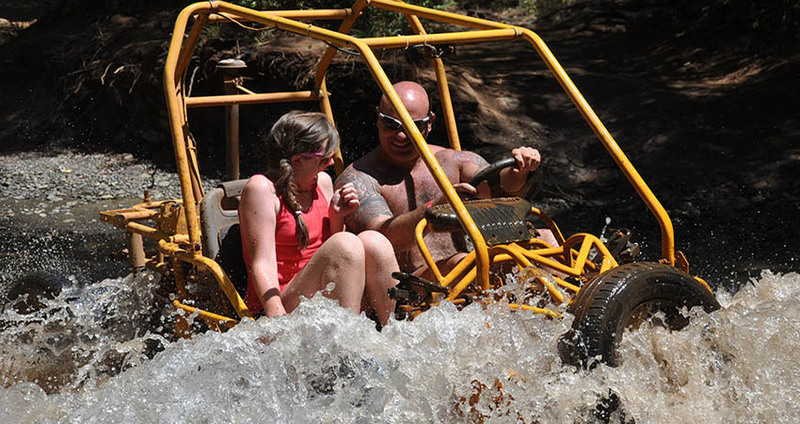 This fun and exciting tour is set through pine woods, shallow riverbeds and muddy terrains. 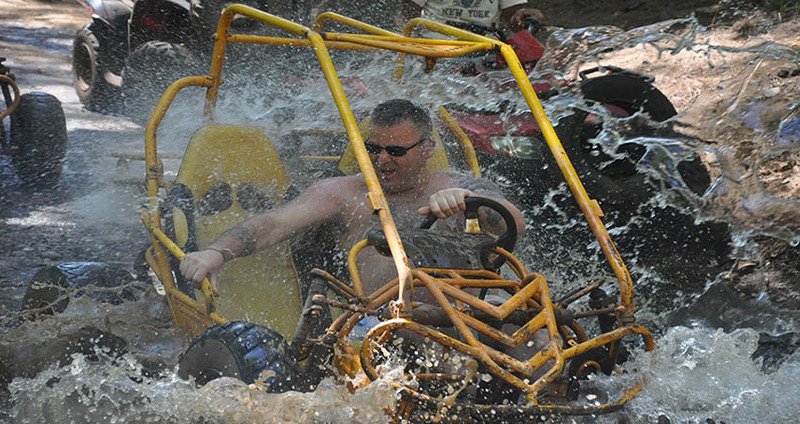 All of our vehicles are well-maintained and in great shape to provide you with a fun and bumpy ride through all of these terrains. The total driving time in this tour is 1 hour. Our skilled and experienced professionals will be with you throughout the tour to ensure your security and enjoyment. 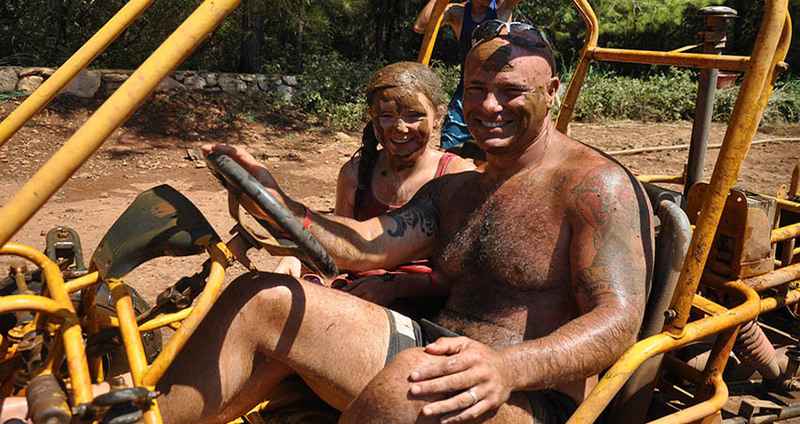 At the end of our tour, after two hours of bumpy ride through dust, mud and water, you will be in need of some cleaning and rest. We have arranged our Buggy Safari tour so that it ends at the area equipped with numerous showers, where you can clean up, change your clothes and freshen up. In the end our driver will take you back to your hotel. Hotel transfers are free of extra charge, as they are included in the tour price. You can also check our Icmeler Quad Safari package.